We had found yellow and purple wax beans at the farmer’s market and I couldn’t resist. My husband had been wishing for yellow beans for some time, but you don’t often see green beans at the local store, much less yellow. I thought the purple ones were fantastically cool, so a few handfuls went in for a treat. Turns out that purple wax beans turn green when you boil them. Damn. Despite the unfortunate loss of color, these are so very good. 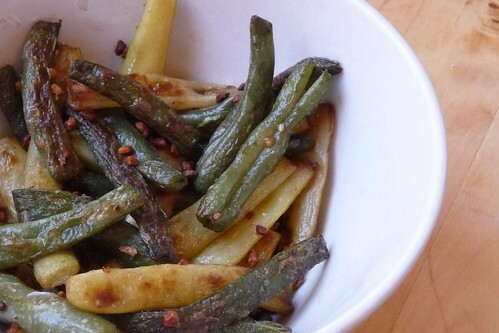 Believe me, you’ll never want to so much as think about green beans in a can again after you’ve had these tasty morsels. Bring a pot of salted water to a boil and add beans. Cook for 10 minutes or until nice and tender, then strain. In a saute pan, melt butter over medium heat and add strained beans, a pinch of salt and some freshly ground pepper. Fry, tossing frequently, until the beans begin to color. Add garlic and stir. Continue to cook until the beans are darkly golden and the garlic is nicely browned. This entry was posted in american, gluten-free, latvian, recipes, side, untranslated, vegetable, vegetarian. Bookmark the permalink.